Executive Summary: There is a great evil that appears every 5,000 years, and locked in a temple in Ancient Egypt is the only weapon that can defeat it: four stones representing the traditional four elements, and a sarcophagus containing the supreme human being, a.k.a. the fifth element. In 1914, large, robotic bug like aliens (Mondoshawns), come to Earth to collect this ultimate weapon to stow it away for safe keeping. Fast forward to the year 2263, and great evil has manifested as a giant blob of doom and it is heading straight for Earth. The Mondoshawns are on their way to deliver salvation, via the ultimate weapon, but their ship is shot down by alien thugs working for corporate mogul Jean-Baptiste Emanuel Zorg, who is tasked with retrieving the elemental stones for the evil blob. Luckily, enough surviving genetic material is found among the Mondoshawn crash site to allow an organism to be recreated, an organism that turns out to be the fifth element (Leeloo). Aware of her mission to save the world, Leeloo escapes the custody of her recreators and literally falls into the life of Korben Dallas, a former special ops agent turned NYC taxi cab driver. High-Tech: Genetic reconstruction; leisurely and other space travel; flame throwing, net shooting, poison arrow launching, freeze ray machine guns with replay feature; make up boxes; food pellets; robot bartenders; multipasses; and of course, flying cars. The list goes on. Low-Life: Korben lives in a tiny, dingy, high rise apartment with unscrupulous inhabitants. He drives a beat up taxi but is eventually fired by Zorg, whose corp owns the cab company. NYC is sprawled so high that there is no ground in sight and when Leeloo looks down off the side of a building all she sees is layer upon layer of traffic. While evading the police, Korben and Leeloo hide in the fog that encases the lowest levels of the city which are, presumably, uninhabitable. Dark Times: The year 2263 looks much like a futuristic, higher tech version of today, but there are nuances that suggest that perhaps things aren’t as great as they seem. For example, government surveillance and control is quite high. Every citizen has a record and law enforcement vehicles come equipped with facial recognition software. Not to mention the yellow dots that one must place their hands in when commanded by authority, even in your own home (or in Korben’s apartment at least). Legacy: The Fifth Element is a mix of genre, but its cyberpunk roots are apparent. Korben is a down and out former soldier who smokes but is trying to quit and who has a cat as his only companion since his wife left him. Eventually he is tasked with saving the world from a pure evil element that’s working through the head of a mega corp. Petty crime is not uncommon, as evidenced by the “gimme da cashhhhhhhh” attempted robbery scene and Korben's wicked confiscated gun collection. Law enforcement is apathetic and out of shape. There are suggestions of body modifications, with Zorg's clanking limp and plastic headpiece. 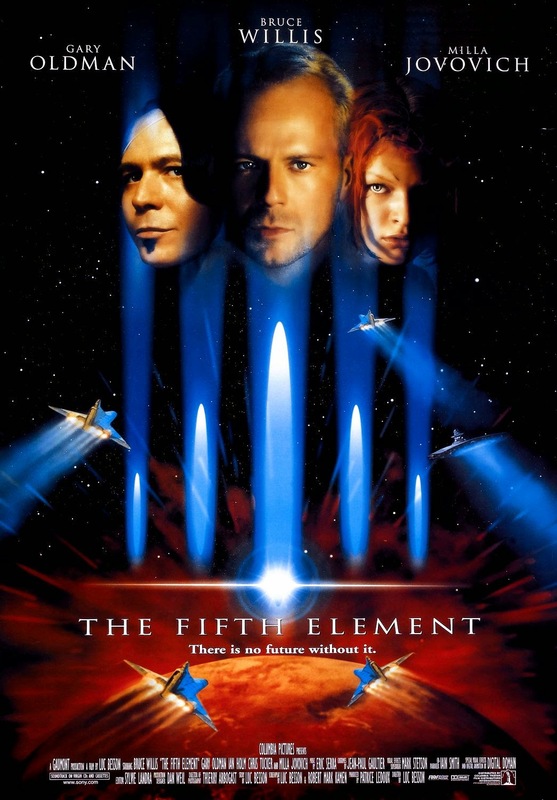 The Fifth Element is primarily a reflection of what came before rather than an influence on what came after. There are few, if any, movies made since that have The Fifth Element’s positive view of Earth’s future and it’s Jetsonslike everyday tech. We just don’t see Earth with flying cars and super high rise cities, or even Earth depicted in such bright colors anymore. And those few films we do see like that are remakes of stories from the past. An exception to this of course is the wonderful(ly horrific) Jupiter Ascending, which doesn’t have a Jetsonslike future Earth, but does have lots of bright colors and rad costumes. In Retrospect: Well, there’s a black president...which at the time was apparently such an absurd notion that it belonged hundred of years in the future. Of course today that role is still occupied by female leaders, but who knows what the near future could bring. Aside from that, Leeloo’s reconstruction scene is a bit eerie/exciting because between 3D printers and test tube livers, genetic reconstruction on that scale doesn’t seem so far fetched anymore. Every time I watch The Fifth Element I wish we had more films like it. Future Earth is so postapocalyptic these days. Yes I know, art reflects the times and we currently hold a Snowpiercerian view of the future, but if you ask me, we need more Bzzzzzzzzzzzzzzzzzt!